Window Switcher is an icon that sits on Quick Launcher bar on taskbar that when pressed, will open Windows Flip3D (if Aero is enabled) 3D dimension or Windows Flip (normal task switcher if Windows Aero is disabled or not supported) to switch between windows. In essence, the Windows Switcher shortcut in Quick Launch bar can be deleted and removed to save the space on QuickLaunch or taskbar for other important icons or windows, as users can always rely on “Windows Logo” button (or Start button) + Tab button keyboard shortcut to initiate Windows Flip 3D effect while switching window. Or users can press Ctrl + Win + Tab keys to activate and stay in Flip3D mode, exactly as what the Window Switcher shortcut does. However, if you have deleted or lost the Window Switcher icon, and now want to recover or restore the Window Switcher icon or shortcut into the Quick Launch bar, here’s a simple trick to retrieve back the “Switch between windows” command shortcut. “Switch between windows” is description by Window Switcher’s tooltip. 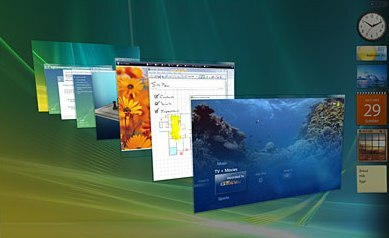 Windows Vista creates and stores Windows Switcher shortcut (Window Switcher.lnk) for every single user profiles on the system. Thus users can copy the Windows Flip icon shortcut from Quick Launch folder of another user (typically the hidden “Default” user, which has less chance of been messed up with), or even copy the Window Switcher.lnk from another computer and place into the Quick Launch directory where the Windows Flip and Flip 3D icon is missing. Right click on Switch between windows shortcut, and then select Copy in the right click contextual menu. Alternatively, highlight Switch between windows and press Ctrl + C keyboard shortcut. In the Windows Explorer window opened, right click on an empty area in the Quick Launch folder, and then select Paste in the right click contextual menu. Alternatively, simply press Ctrl + V keyboard shortcut. Voila, you should now see a Window Switcher shortcut with correct icon and valid “Switch between windows” tooltip in the Quick Launch bar on Taskbar. Well, if all Window Switcher.lnk files has been deleted on your system, and you have no other PC to fall back to, simply download this windowswitcher.zip (no longer available) which contains Window Switcher.lnk file. Then follow step 3 and 4 above to place the Window Switcher.lnk downloaded into Quick Launch folder.